Information Technology University (ITU) Lahore Punjab. Information Technology University requires the services of qualified, energetic & self-motivated candidate on contract basis for the externally funded project. Applications are invited for the following positions from candidates who meet the specified criteria. Qualification: Must have at least 16 years of education. with a recognized bachelors degree from local or foreign reputed university. Experience: Some experience in development sector weeds is preferred. Good communication skills and fluency in English. Urdu. and Punjab. Qualification: Must have at Mast 16 years of education, with a recognized degree in a subject within Humanities and Social Sciences or relevant field, from local a foreign reputed adversity. Experience: Candidates with two years of experience in Monitoring and Evaluation for development sector projects will be preferred. Good communication dolts and fluency in English. Urdu. and Punjabi are rewired. Qualification: Must have at least 16 years of education. with a recognized degree in a subject within Humanities and Social Sciences or relevant field, from local a foreign reputed university. Experience: Candidates with localized repellence in Kasur and Sheikhupura will be preferred. Good communication skills and fluency in English. Urdu. and Punjabi are required. Qualification: Must have at least 16 years of education. with a recognized degree in a subject within Humanities and Social Sciences or relevant field, from local or foreign reputed university. Experience: Candidates with experience in conducting training sessions in multiple subject areas for different age groups will be preferred. Good communication skits and enemy in English. Urdu. and Punjabi are required. Qualification: Mist has at least 16 years of education, with a recognized degree in Psychology or another relevant field, from a local or foreign reputed university. Experience: Candidates vino have specialized in child sexual abuse prevention, or have worked with patients existing problems stemming from this issue. will be preferred. Good communication skis a-id fluency in Engish. Urdu. and Punjabi are required. Qualification: Must have en IMES. with a specialty in Pediatrics. Experience: Candidates vino have experience within sexual abuse prevention programs or have worked with patients existing problems stemming from this issue will be preferred. Good communication sides and fluency in English. Urdu. and Punjabi are required. Qualification: Mist has at least 16 years of education, With a recognized bachelors degree from a local a foreign university. Experience: Candidates we experience in designing illustrations for children's books Of study materials will be preferred. Qualification: Mist has at least 16 years of education, with a recognized bachelors degree from a local or foreign university. 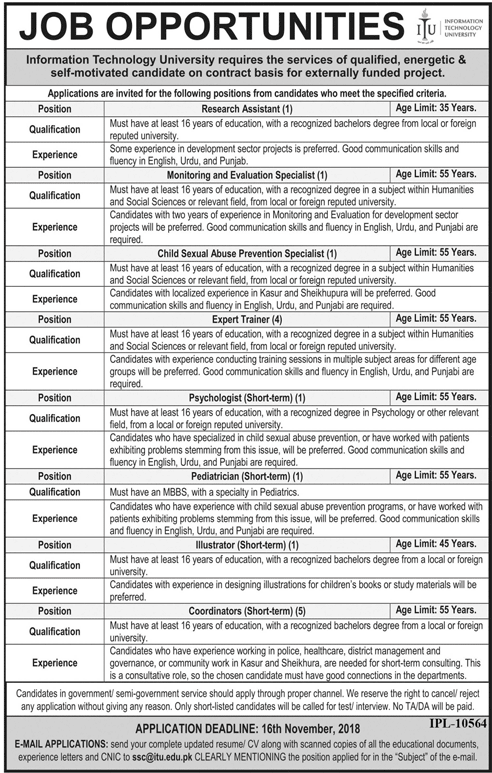 Experience: Candidates who have experience waking in a police, healthcare, district management and governance, or community work in Kasur and Sheikh's a are needed for short-term consulting. This is a consultative role. so the chosen candidate must have good connections in the departments. Candidates in government, semi-government service shard apply through proper channel. We reserve the right to sanest' reect any application without giving any reason. Only short-listed candidates will be called for test/ intenteiv. No TADA will be paid. EMAIL APPLICATIONS: send your complete updated resume / CV along with scanned copies of all the educational documents. experience letters and CNIC to sscetu.edu.plc CLEARLY MENTIONING the position applied la in the 'Subject' of the e-mail. ssc@itu.edu.pk.